I trust you all had a lovely, happy holidays filled with love and presents. Twenty Fifteen is unbearably close, before you know it I’ll be plagued with exam stress and mocks again. 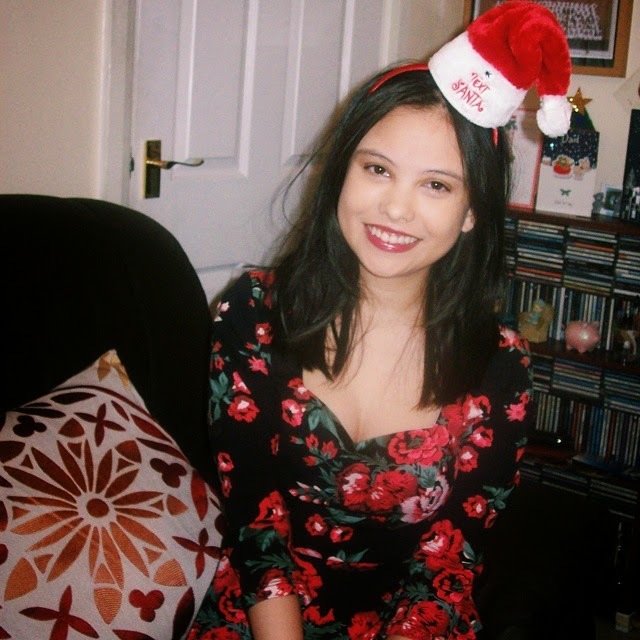 So before I disappear into a black hole of revision notes and booklets, how was your Christmas? Did Santa bring you everything you wanted? How did you celebrate it? For me, I celebrated it with my family as always. My mum cooked us a lovely chicken dinner, as we’re not overly fond of turkey, accompanied by gravy, carrots, roast potatoes, stuffing and a whole batch of other vegetables. As for presents, I got a lot of new clothes I absolutely loved. More importantly, for all my fellow bookworms out there, I got a ton of books. 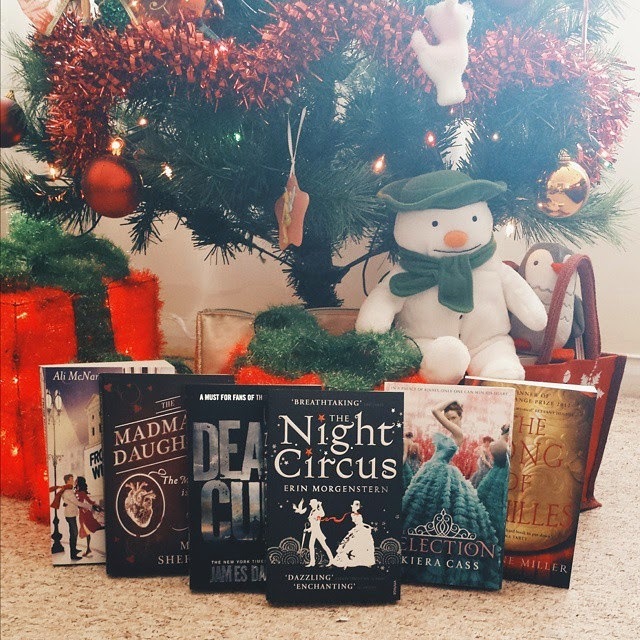 You might have seen me post a list of ‘5 Books I would like Santa to bring me’ along with a blogging friend of mine, Danee, over on FictionFunction for our Top Ten Tuesday segment here. I’m pleased to say that those books were underneath the Kilford family Christmas tree this year. Thanks Amazon— I mean…. Thanks, Santa! At the time of writing this, I have started and am just over half way through The Selection by Kiera Cass. So, you can expect to see a review of that fairly soon. Unfortunately, my Mara Dyer obsession came too late for Amazon—I mean, Santa, to deliver it in time. So, I’ll have to wait until the New Year to find out what happens to Mara and Noah which is torture. Books I got from left to right: From Notting Hill with Love…Actually by Ali McNamara, The Madman’s Daughter by Megan Shepherd, The Death Cure by James Dashner, The Night Circus by Erin Morgenstern, The Selection by Kiera Cass and The Song of Achilles by Madeline Miller. All of these are on my shelves on GoodReads. So, you can take a gander there if you want to know more about each. I’m really looking forward to getting my nose stuck in these books. Make sure you follow/are my friend on my GoodReads to see my progress, reviews and find out what I’m reading next. 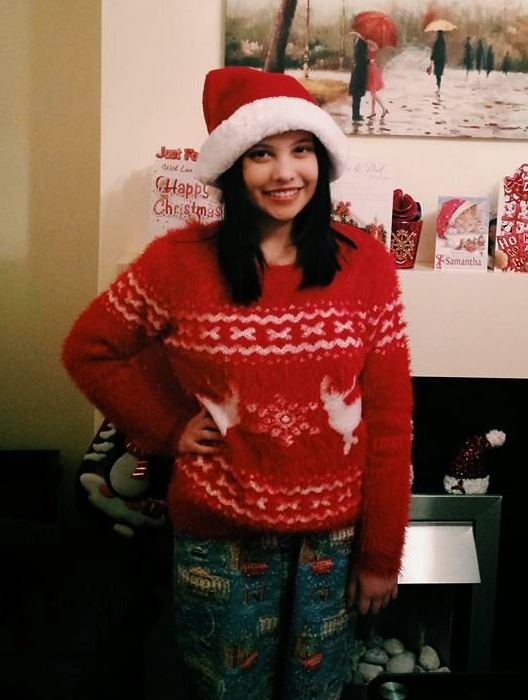 Feeling excited on Christmas Eve. 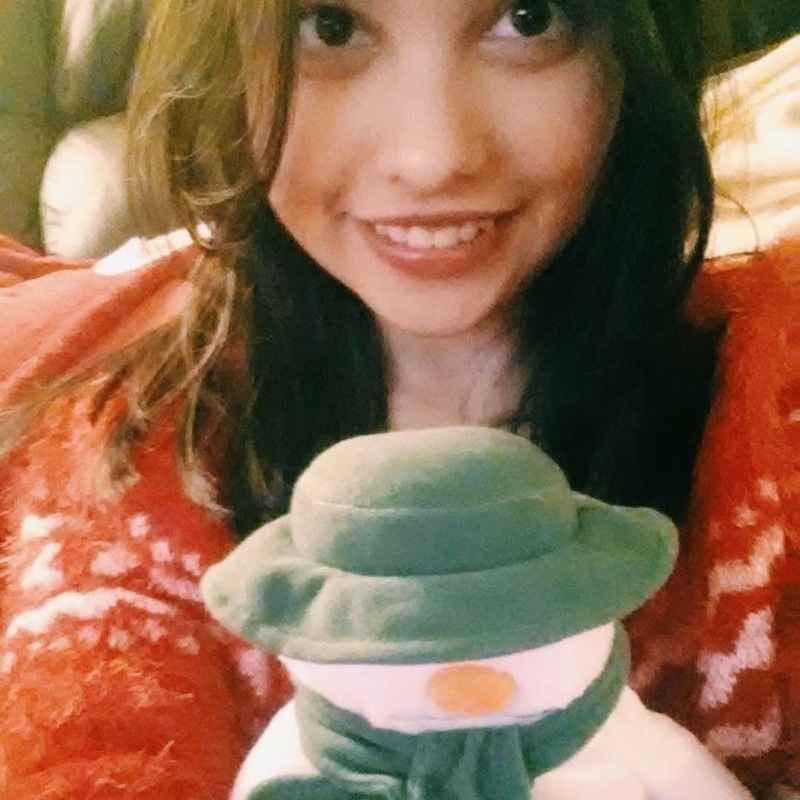 In addition to all those books, I got this awesome Snowman plushy which can also be seen in the book photo. As sad as it is, it’s my favourite present this Christmas because it’s absolutely adorable. It’s a cuddly snowman from the 1978 children’s book/1982 film adaptation (We’re walking in the aiiiiir…remember it now?). Not a hundred percent sure where my parents bought it from, but I’m a big kid so I love it. I have the urge to take it everywhere with me just so the magical Christmas feeling never fades. 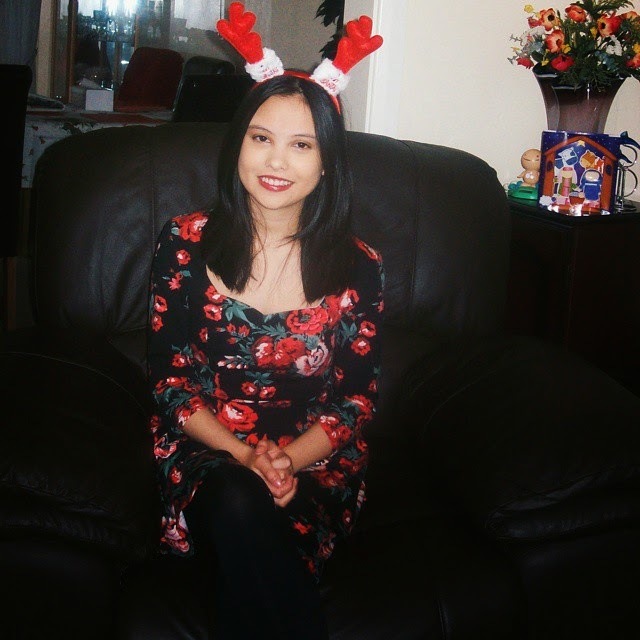 Dress: Dorothy Perkins @ Debenhams.Antlers: Text SantaTights: Any old black tights will do, really! I hope each and every one of you had a fabulous time with your friends and family no matter what you celebrate and that Santa or the shopping gods that be were kind to you this year. It’s forecast to snow here in the UK fairly soon which is exciting and means that I can go out and build myself a real snowman. But to everyone in places where it’s due to snow or it has already snowed, please stay safe. You look so pretty!! And, by the way, I love your blog, so thanks a bunch for visiting mine! 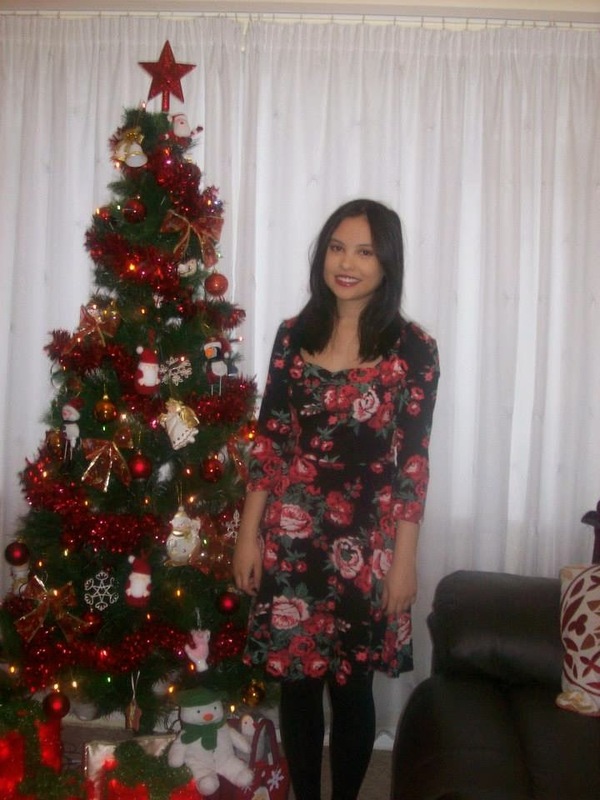 ^_^ I did celebrate Christmas too, with my mom and her boyfriend's family. (We were 32!!!) I was so exhausted after!! But, hey, there was ambience 😛 And, yeah, I did get many books (19 actually) haha don'T judge, it was Christmas after all ^^ and they were all for a total of 140 so…not bad, I think. Oh, I loved ''The Selection'', really enjoyed, even though it was slow, ''The Night Circus'' and look very forward to reading ''The Madman's Daughter.'' Seems like you had a pleasant day! Happy New Year! Thank you very much! I love your blog too, it's great! I'm glad that you had such a great Christmas too. I just finished the 'The Madman's Daughter' and I'm in awe of how brilliant it was, my review will be up in a few days. Thanks for visiting my blog! Happy New Year to you too!